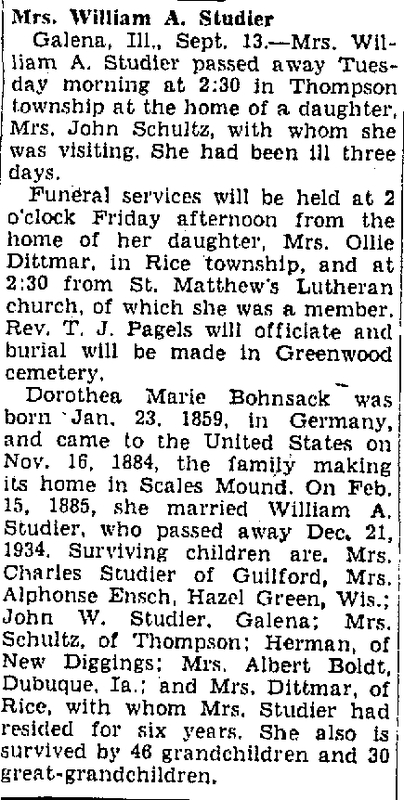 This obituary is for Dorothea (Bohnsack) Studier from the Freeport Journal-Standard, Wednesday, 13 Sept 1944, page 1. She was the sister of my g-g-grandfather, Carl Herman Bohnsack. Galena, Ill., Sept. 13.—Mrs. William A. Studier passed away Tuesday morning at 2:30 in Thompson township at the home of a daughter, Mrs. John Schultz, with whom she was visiting. She had been ill three days. Funeral services will be held at 2 o’clock Friday afternoon from the home of her daughter, Mrs. Ollie Dittmar, in Rice township, and at 2:30 from St. Matthew’s Lutheran church, of which she was a member. Rev. T. J. Pagels will officiate and burial will be made in Greenwood cemetery. Dorothea Marie Bohnsack was born Jan. 23. 1859, in Germany, and came to the United States on Nov. 16, 1884, the family making its home in Scales Mound. On Feb. 15, 1885, she married William A. Studier, who passed away Dec. 21, 1934. Surviving children are. Mrs. Charles Studier of Guilford, Mrs. Alphonse Ensch, Hazel Green, Wis.; John W. Studier, Galena; Mrs. Schultz, of Thompson; Herman, of New Diggings; Mrs. Albert Boldt, Dubuque, Ia. ; and Mrs. Dittmar, of Rice, with whom Mrs. Studier had resided for six years. She also is survived by 46 grandchildren and 30 great-grandchildren.